Over the past decade, Wells Fargo has courted the Latino market through community outreach, Spanish-language advertising and programs that allow immigrants without U.S. identification to open bank accounts. But according to the National People’s Action Campaign, part of a coalition effort to undercut financial support for private prisons, the bank appears hypocritical when it comes to serving Hispanics. On behalf of investors, Wells Fargo holds shares in GEO Group, a company that operates private prisons and immigration detention centers. 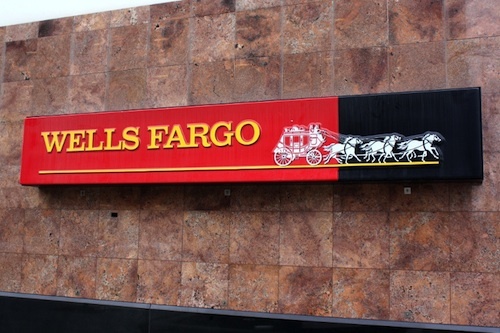 Wells Fargo thinks the campaign tying them to private prisons is misguided. Wells Fargo does, however, place investments in GEO Group, a publicly held company that operates a network of private prisons and immigration detention centers across the country. Those investments have been the target of a prison divestment campaign that has lasted a year and a half. The heart of the argument against GEO Group is an argument against all private prisons: When incarceration becomes a for-profit venture, lawmakers will find ways to keep cells filled. Earlier this year, the campaign convinced the pension board for the United Methodist Church to drop nearly $1 million in stock it held in GEO Group and the Corrections Corporation of America, another company that operates private prisons. Wells Fargo has also dropped a significant amount of the GEO Group shares it held on behalf of investors. During a six-month period ending September 30, the bank shed 36 percent of its holdings, going from roughly 4.7 million shares to 3 million, according to figures provided by the company and an independent analyst. Erik M. Oja, an equity analyst at S&P Capital IQ, backed that up, saying that such a shift was “a little of an anomaly” but nothing too strange for a financial institution as large as Wells Fargo. Even as Wells Fargo scales down investments in GEO Group, private prisons show no sign of diminishing. Deportations have reached record highs during the Obama administration and the growing number of detainees are increasingly likely to end up in a privately run facility. Nearly half of immigrant detainees are now held in private facilities, versus a quarter a decade ago, the Huffington Post reported in June. GEO Group has profited from that increase, nearly doubling its revenues from immigrant detentions since 2005. When asked about the campaign against private prisons, a spokesperson for GEO Group stressed that while the company may by private, it follows guidelines set by the federal government and U.S. Immigration and Customs Enforcement (ICE). From 2003 to present day, GEO Group has spent nearly $3 million on lobbying efforts, with $913,000 contributed to political campaigns, according to the National Institute on Money in State Politics. The company spent the vast majority of those dollars in Florida, California, New Mexico and Louisiana. Since 2002, the number of detainee beds that are private versus public has tripled. Peter Cervantes-Gautschi, the director of Enlace, which is coordinating the prison divestment campaign, said he’s glad to see Wells Fargo cutting back on investments in GEO Group, regardless of the motivation, but that the reduction isn’t enough.